In honor of all things love and all things PRIDE during this month of LGBTQ celebration, Modehaus has partnered with some local vendors who share our message of inclusivity. 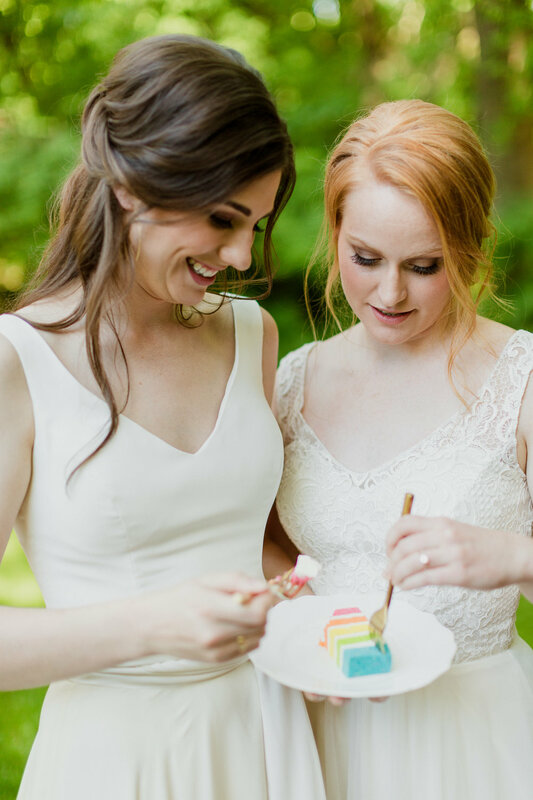 With a spectacular rainbow theme wedding, styled by BRE IS FUN, and featuring the most incredible couple, Ella and Grace, our team of local ladies spent the day capturing some truly breathtaking moments. Our Brides, Grace and Ella are both nurses (aka Superheros!) who met while attending nursing school. This past March, they were married in a small private ceremony in Grace’s parents living room surrounded by their loved ones. Ella is a nurse for the Army and will be on deployment for a year, beginning in July. This was a fun opportunity for them to get dressed up and celebrate their love again before they're apart for a while. What a privilege for all of us to be witnesses to their joy and love for each other! The setting for this shoot was Camrose Hill Farm. A breathtaking venue in Stillwater, Minnesota. Voted the best outdoor venue in Minnesota Bride 2017 Awards, they have lots of room for guests and even provide the floral styling for the venue. There is forest, hills of green, and blooming flowers everywhere. Cindie and her team styled a rainbow themed wedding mantle for our ceremony. Bre styled the event and did day-of coordinating with help from Ultimate Events. The flowers were not the only thing colorfully themed, Bre’s hair is always a taste of the rainbow. She styled every table setting monochromatically to create a vibrant look! My of Paper Thick Ink made geometric rainbow themed wedding place settings, invitations, menus, and YES, even LaCroix water toppers! Bre and I share a devotion to LaCroix and are always on the hunt for the elusive key lime flavor. Their colorful cans were the perfect refreshment! 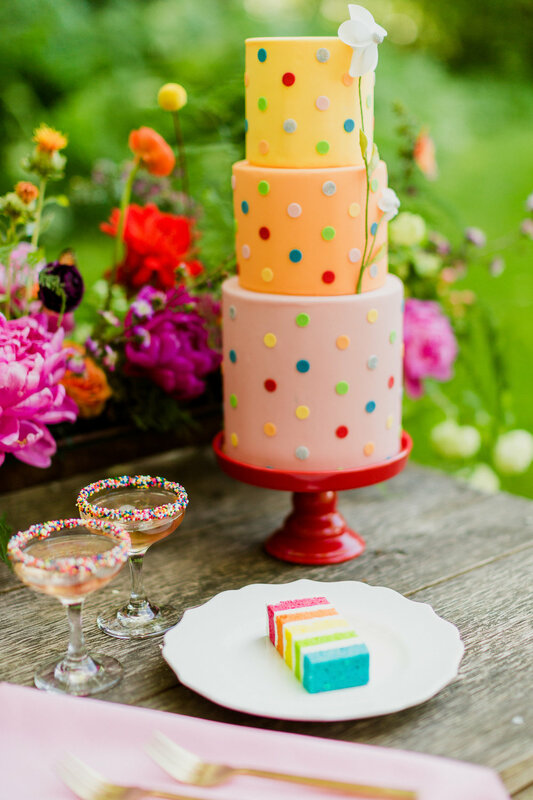 Ink Sweets made a three-tiered cake with rainbow polka dots! The inside did not look bad either (cake eating moment to follow!) Thumbs cookies almost did not make it to the table because we couldn’t keep all ten of our fingers away from them. Or wait... are thumbs considered fingers? Anyone have their pointer on the pulse for that information? Alright, I’ll stop. Don’t want to over play this metaphor’s hand. Ink Sweets and Thumbs cookies happily serves desserts to all couples. 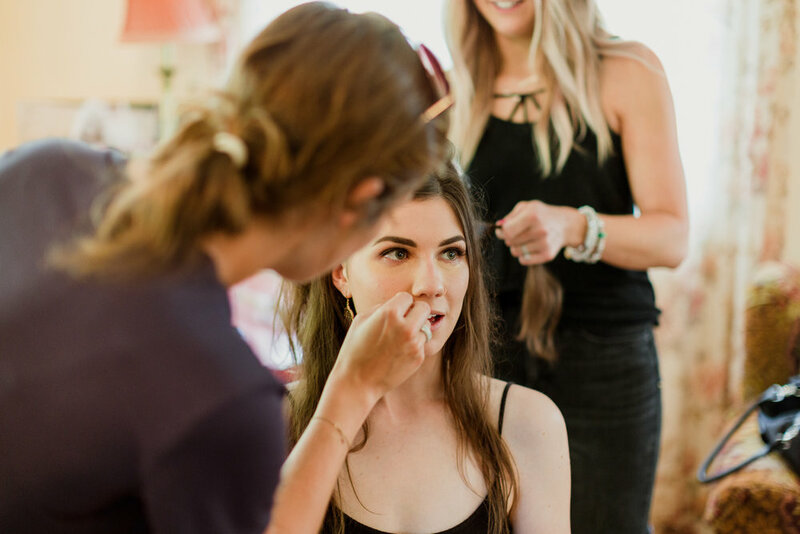 As the styling was underway, our brides were pampered in the adorable cottage next door. It was the perfect summer day with a warm sun and the lightest breeze. Birds were chirping and the fountain was babbling. SM Hair + Makeup created bold, beautiful, and complementary looks for Ella and Grace. Grace wore a purple smokey with her hair half up and half down. Ella had a soft summer peach shadow with an updo. Both had soft and natural curls that looked effortless. I don’t know if you can tell, but they loved their looks! Once the SM team was finished with hair and makeup, it was time to get the gals into their gowns! Ella wore the Lillian gown from our You Are My Muse collection. With layers of soft tulle and a embroidered alencon lace, this dress is timeless and romantic. Both gowns were chosen by the brides. Though from different collections, they complement each other with subtleties like the similar necklines, button details, and flowing skirts. Grace wore separates from our Take Flight collection. The scalloped train wrapped around her waist with a silk crop top. The layers of buttery silk catch the softest breeze. And yes, that’s me rocking my gameday fanny pack! Before long we were enchanted by greenery and over the moon for Grace and Ella moments. These two were captivating. Our incredible photographer Alyssa spent the day shooting every minute of our rainbow themed wedding. From the nibbles of cake, to the confetti toss, and final walks in the sun. Cheers to sprinkles, cake, and rainbows! Did someone say confetti?! Imagine Grace and Ella with bouquets in hand ready for the camera. Bre and I, crouched down on either side of them (don't really know why we were crouched - it's not like we were serving volleyballs). We have fist full of confetti ready to toss in the air! On the count of three...two...one! After a LaCroix and Thumbs cookie break, we chased the golden hour through the Camrose Hill field. Maybe it was the sugar rush, or maybe it was the high we were riding after such a perfect day, but these last moments were magical. You may have guessed by now, but the "dress billowing shot" is usually my favorite. These were the last shots before we wrapped. *swoon* What more could you ask for?! An incredible team, a couple in love, and the perfect summer day in Minnesota. We are truly grateful to all involved! Happy Pride everyone! Can't wait to see the festivities ensure this weekend in Minneapolis. Visit our Facebook page for more scrumtious content from our rainbow themed wedding day!